When they first came out in 1997 with their "Glory To The Brave" album, the metal scene, save for the Euro trail where they have and continue revel in the splendor of tradition, was somewhere between a resurgence and redundancy. Heavy Metal in the traditional sense, was being eaten alive by fans and critics alike as being irrelevant and dated; anthemic battle hymns and musicianship held little intrinsic value where real world issues stamped their boot print on the decidedly more extremist preachers and players portrayed as the "Nu-Metallers" that had been polluting the pages of rewritten Rock mags and Hard radio. 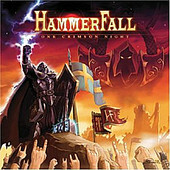 Considering the fate of many beloved forerunners of the Metal revolution, bands like Priest and Maiden, going through their own individual infirmaries of lost members and lower sales, save for the incalculable success of the German greats and Gothenburg's up and comers, Hammerfall's success hinged greatly on the individualistic tendency of the listener. Luckily for them, and the many who've followed suit, Metal's resurgence remains a continuing phenomenon that's patterned itself much like it began, growing stronger in time and standing firm against mass opposition of mainstream media. Anyone in those circles that heard Hammerfall's first record either had a good laugh or rejoiced in the fact that a new band not named Manowar could produce such a potent yet polished display of heavy riffing and melody lines encircling battle-ridden lyrical clich?s to rival the mightiest of the medievally-trained greats. When "Legacy Of Kings" came out a year later, there was further confusion in the fact they could do it again! By this point, Gothenburg was already a hot bed of happening bands pioneering a popular style of heavy music lent to old school Thrash, and modern Death, borrowing from each and encasing the whole in a dynamic new sound led by the likes of At The Gates, In Flames and Hypocrisy. Ironically, Hammerfall's another that calls Gothenburg home, yet comparatively speaking, there aren't any. And there's where we now find the band, truly in all their glory, fronting 4,000 strong highlighting their successful Crimson Crusades tour that saw them hit eight continents even denting the daunting armor of U.S. shores with Dio and Kings-X. The two disc set follows four successful studio albums featuring all the fist-raising, light flicking fan favorites the self-indulgent Swedes have become known for; like the foreboding lead-in, "Lore Of The Arcane" and "Riders Of The Storm" from their latest "Crimson Thunder" studio release; "Legacy Of Kings," the title track from their renowned second effort; the necessary (and Nordic) between song banter, bass and guitar solos, and then "The Way Of The Warrior," "Glory To The Brave," going back to the beginning, before closing disc one with "Let The Hammerfall," another "Legacy Of Kings" staple which lets loose a barrage of fanfare and exhalation FX to rival even the ardent of German festival goer. The production quality is excellent overall but really that should be the least considered in this age and inexcusable should the issue arise of a buried mic or stuffy drum head. The only deficiencies should be the band's own natural missteps and for the most part, there are none present here. Disc two sees them plow through "Renegade" from their gold-earning third album of the same name, and "Steel Meets Steel," a sentimental storyteller from their stealthily bred start up; "Crimson Thunder" and "Hearts On Fire" account for more of the latest studio work from the iron clad "Crimson Thunder" LP, bore of the chivalrous chorus and particularly weighty riffs, that unlike some, upon first mention, receive equal praise as do the holiest of classics from the crowd in attendance, bothered apparently by neither the repetitive notion of (our) standing alone, as one-- we are the strong-- drop the hammer-- crack the sky and various supposed infantile folklore that should have died out ages ago. The set features a colorful cover book packed with performance footage, metal poses, moon shot and three bonus cuts from the great beyond, including the enthralling intensity of "The Dragon Lies Bleeding." Who'd have thought after seven years, four studio albums of hammer slamming exploits and Gothenburg's own prestige, this against the grain, second coming of Saxon, could equate on the grand scale of worldwide acceptance? An achievement countless others before could never achieve and to stand proud amongst the few who remain true and become rewarded when changing tides shift to their favor. Hammerfall's deserving of the accolades and this flawless two-disc set is the perfect accompaniment or primer for the ardent fan or uninitiated on what true metal spirit is about.